iPhone backup encryption is one of the best features that allows you to protect your backups. Your encrypted backups are protected with a password. If you forget the password, then you cannot access those backups. 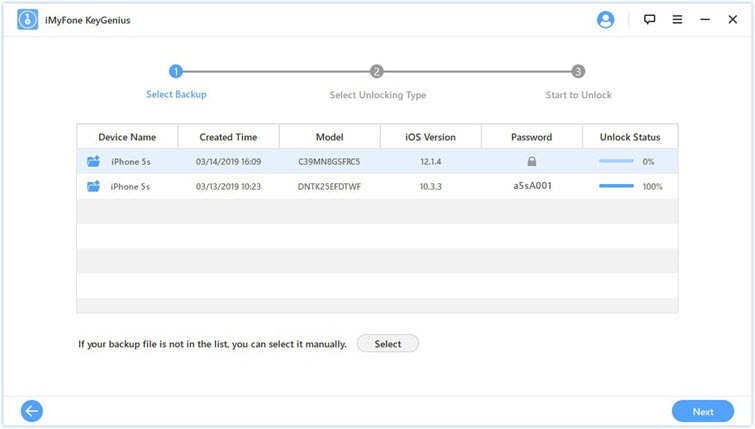 Fortunately, there are iPhone backup password recovery tools available that can help you find/recover the forgotten password. With a variety of such tools available, it can be difficult to decide which one is the best. This article will help you in this regard. iMyFone KeyGenius iPhone Backup Unlocker is a powerful iPhone backup password recovery tool that uses advanced algorithms to help you find the password in an efficient way. The software is programmed with the latest technology at 2019 and features 3 state-of-the-art iPhone password decoding modes. Thanks to these, KeyGenius has a very high success rate when it comes to recovering iPhone backup password. KeyGenius is 100% safe to use as it does not corrupt or damage the backup during the password decoding process. High success rate on iPhone backup password recovery. Three advanced and powerful modes to decode iPhone backup password. User-friendly software interface. Decoding iPhone backup password via this tool is easy as 1-2-3. Can also remove backup encryption settings and enable you to create backup without password. Compatible with all latest iOS and iTunes versions. Step 1. Launch KeyGenius on your computer. And click on Unlock iTunes Backup. Step 2. Then choose the backup of your choice on the next screen. Use the Next button to proceed. Step 3. Now select one of the unlocking modes and click on Start to Unlock to start the password decoding process. iSeePassword iTunes Password Recovery provide easy solutions to help you decode and decrypt iPhone backup password. The tool is equipped with traditional password cracking mechanism that can help you find iPhone backup password. User-friendly interface. Suitable for beginners. Two powerful attack types. If one mode doesn't work, you can try another so your chances of finding/recovering the iPhone backup password are really high. Does not support dictionary attack. So, you need to remember part of your password e.g. affix, length, etc. to speed up the decoding process. It does not usually work on long and complicated passwords. Not compatible with iPhone 8 and latter models. 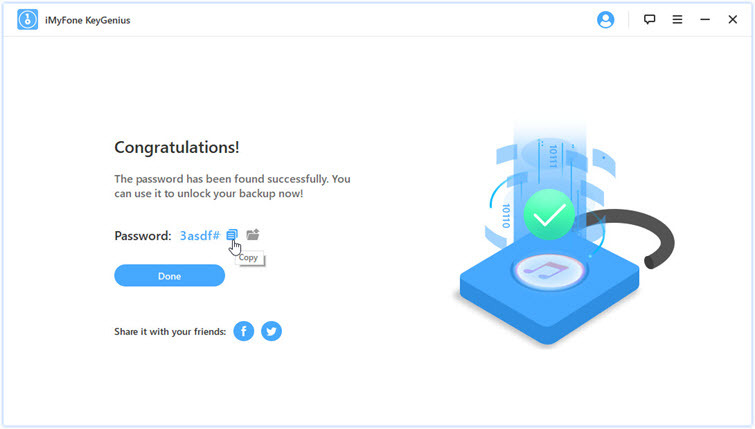 iSunShare iTunes Password Genius is another iTunes backup recovery tool that you can use when you forgot the backup password. The tool features 3 useful iPhone backup password attack modes so the chances of recovering the password are pretty high via this software. You can recover short passwords (that contain no more than 3 characters) for free via this tool. Three iPhone backup password decoding methods. These include Dictionary, Mask, and Brute-Force. Fully compatible with all versions of iTunes backup. Complicated for beginners, old interface. The software takes a long time to recover long and complicated passwords. Some users have reported that this tool does not work for backups in the latest iOS 12. 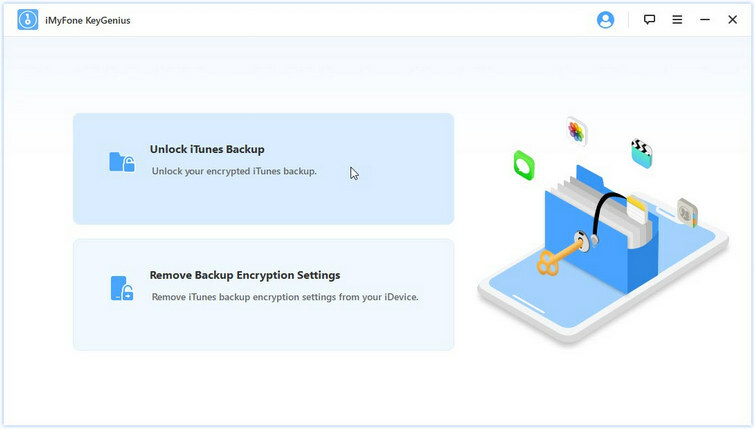 7thShare iTunes Backup Unlocker is a powerful iPhone backup password recovery tool that is compatible with all iOS devices. Just like iSunshare, it has three modes to decrypt iTunes backup. Furthermore, using the software is pretty easy as the entire decoding process involves three simple steps. Three powerful attack methods. 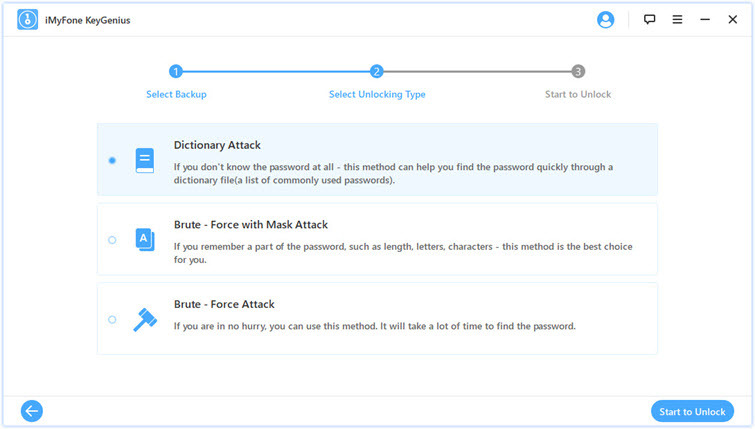 Including Brute - Force Attack, Dictionary Attack, and Brute - Force with Mask Attack. Only 3 steps to decode iPhone backup password. Fully compatible with all iOS device versions. 7thShare iTunes Backup Unlocker is not compatible with Mac. It only supports Windows. iPhone backup password recovery is possible thanks to the wide variety of iPhone backup password recovery tools available on the market. These tools use advanced algorithms and different attacking methods to find your iPhone backup password. While you can use any of the above-mentioned tools, iMyFone KeyGenius is a recommended choice. It is a preferred choice of many iOS users due to its wide compatibility, user-friendliness, and very high password recovery success rate.